On March 2, 1980, a car fire was reported on Lake Road, west of Chandler, Oklahoma. 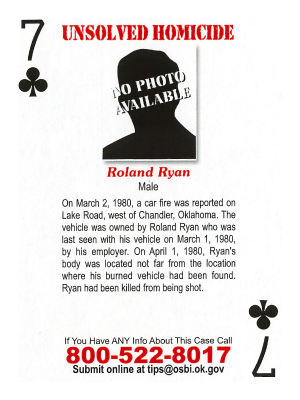 The vehicle was owned by Roland Ryan who was last seen with his vehicle on March 1, 1980 by his employer. On April 1, 1980, Ryan's body was located not far from the location where his burned vehicle had been found. Ryan had been killed from being shot.